Always make a good first impression. I was late. I had decided to take a day off on Friday and I was still late! Fortunately neither the skipper nor the mates looked like they wanted to kill me and I wasn’t the last to arrive. During group introductions I was surprised and relieved to hear that there were a number of other first time sailors aboard. Mother – cooks food and makes tea for more people than you have ever cooked for before (unless you are my brother) with a single hob and a tiny tiny oven. The first couple of days were exhausting (the work is physical and there is a hell of a lot to learn). I remember thinking that I wasn’t sure how I would get by if the tiredness and aching muscles continued to increase. At the end of each day we explained to the group how we felt. On day 1 I said I think I need to build up my upper body strength. Skipper suggested it was technique – “Look at Ellen McCarther – she is tiny and she does it all on her own”. I countered that I am pretty sure she could do a decent amount of pull-ups. Toward the end of the week either my strength had really built or there is indeed something to be said for technique. Sail trim – I learnt in my aerodynamics courses at university that boats are definitely more difficult to fly than aircraft and this is an opinion I am sticking with! Got the email through saying that Dave (my level 1 training skipper) would also be Level 2 skipper. In one way I was pleased about this – I like Dave’s style of training and he also reminds me very much of my friend Ed. On the downside I was quite nosy about some of the skippers are who have applied for the 15/16 race and was hoping perhaps to meet one of them. Francois and I were assigned to pseudo-mother watch on Day 1 (technically Day 2, Day 1 was sea survival). We hadn’t yet established the watch system, hence the pseudo. Breakfast didn’t start well. Bacon and eggs. Cooked for 13 people in one small frying pan because the grill didn’t work. Ended up as bacon and bacon grit (I had a banana). Lunch was Cornish pasty and beans (this is my food hell, but at least managed to persuade Francois not to spice up the baked beans with an onion). This was cooked in an oven without shelves. The biggest disaster was B’s gluten free sausage roll (really sorry B). By dinner a headache I had been nursing for a few days seemed to get worse. The smell of starchy potatoes and fruit tea, the motion of boat and the heat of the kitchen suddenly overcame me and I had to step on deck with Helen kindly filling my shoes in the galley. They concocted a tasty smelling sausage and mash but by that stage the thought of putting anything in my mouth was unbearable (including even a paracetomol for my headache). I haven’t felt seasick before but the only way I can describe how I felt was that I simply “could not”. I lay down on the bunk for 4 hours wishing I was anywhere else. I remember thinking that I had heard people usually get over feeling seasick in 48 hours. 48hours!! By the time it got to 2am I was feeling better enough to feel guilty and slightly jealous that I had missed the deck based activity of the past 8 hours. 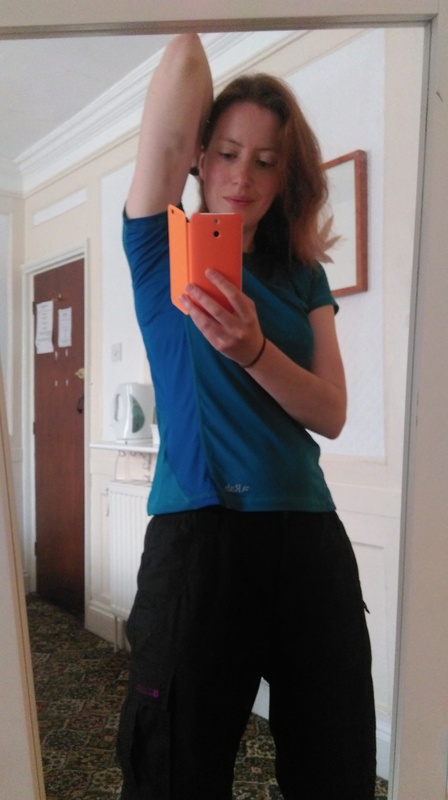 Whilst I had been lying in pain for 4-5 hours then sleeping fitfully for 3 hours the wind had picked up so much (to Force 8 I think, with forecast threatening more) that it was necessary to pull in to Weymouth (?) bay. There had been some trouble getting the mainsail down and also setting the anchor. I headed up on deck. During this watch our job was to periodically check the anchor still appeared to be there and look for any significant rope chafing, in addition to checking that we hadn’t drifted off somewhere into the shipping lanes. By the time we went back on watch the next day at midday I was feeling much better, although I can’t remember what we did so, on reflection, maybe I still wasn’t quite myself! Next watch began at 10pm. I jumped in to have first turn on the helm thinking that in the dark I can’t see the big scary waves and there is less to distract me. I had been nervous about helming with my fear mainly being that I will lose control of the boat and hurt everybody and break something difficult to repair. Especially because some of the more experienced sailors in the group had seemed to fight with it earlier. The key seemed to be a bit like flying an aircraft – most of the time it seems to correct and steer itself so you need to do less than you think (I hear the 70s are more difficult, so I won’t speak too soon on this). I loved sailing at night near the coast. It feels like being a deviant somehow, like going for a walk in wet weather. Not sure it will be the same feeling in the ocean without the twinkling lights from the shore. We’ll see. 2am came and we rolled downstairs and into our bunks. At this point it had been predicted that the wind would have shifted to an easterly which would push us back west. This didn’t happen. But west we needed to go so for the next 4 hours we tried to sleep as the boat slammed into the waves. Down in “the ghetto” (i.e. crew sleeping area/sail storage area) fairly benign conditions seem a lot more exciting than they actually are. A simple tack can sound like the world is coming to an end – banging, creaking, shouting and then being flung from one side of the bunk to another. As we bounce over waves the “sleeping” crew become momentarily airborne. I didn’t sleep for fear that I would be flung from my top bunk. As a new sailor the motions and sounds below deck were all somewhat alarming and I cowered in my sleeping bag wondering how a) I would ever sleep in the livelier conditions of the southern ocean or north pacific or b) how I would get there in the first place without completely freaking out! After a restless night I stuffed in some breakfast (my appetite still not fully recovered) and we were back on deck. In between putting in reefs and tacking I learnt something new about myself. It is perfectly possible for me to fall asleep whilst sitting upright on a boat that is beating upwind. Due to the weather we hadn’t had many MOB drills that week. On Wednesday it was my turn to wear the pants of power and, with an improvement in the weather, I knew I was in for a soaking. Despite being very worried that I would somehow struggle with this – in the benign conditions it was actually ok. I found the key is to mount Bob and squeeze him tight (imagine he’s Johnny Depp or Kylie or someone if that helps!) Obtained some interesting bruises on my inner thighs. Final evening came and the fog threatened to descend. The decision was made to pull in early and make last orders at the pub. We arrived in port with very little time to spare but – spurred on by the enthusiasm of Elaine, who I believe was spurred on by the thought of a pint, we packed the sails (neatly) and also removed and flaked the mainsail ready for some onshore repairs. Sadly the local was closed, but the Wetherspoons in town still had some beer so we all enjoyed a refreshing (secret – ssshhh) beverage. On the final day we do a deep clean. This is a clean that takes a dozen people at least 5-6 hours so you can imagine what this involves. Basically everything comes out, including the floor boards and we scrub it all down. It was a tremendous help that the sun was shining – meant the bed cushions and boards could dry a little. We will be doing this in every port on the race. Prior to Level 3 I could best describe my mood as anxious. All I can remember from Level 2 is feeling sick and then the rest of the time passing in a blur. Everyone in the group had seemed so on top of things and I felt that things hadn’t sunk in as much as they should have. I was anxious that I hadn’t sailed since Level 2 and that time I should have been spent studying sailing theory had instead been spent watching The Killing on Netflix. Day 1 of level 3 begins with sea survival (theory day) at Clipper HQ. This is basically 101 ways to die at sea. Covers all the things that are at the back of your mind but you don’t really want to think about e.g. mast breaking, hole in the boat, boat catching fire, boat exploding, etc. This was spiced up further by some first-hand experience from Dmitry who had been a medic on board Qingdao in the 11/12 race and was back for more. His first story involved a head injury and a Russian submarine. Main lesson I gathered on the day from the videos is that kerosene on toast is probably not a good idea. Search Yachting Monthly Crash Test Boat on YouTube to see why! Overall the week was fun. It was far more like Level 1 than Level 2. 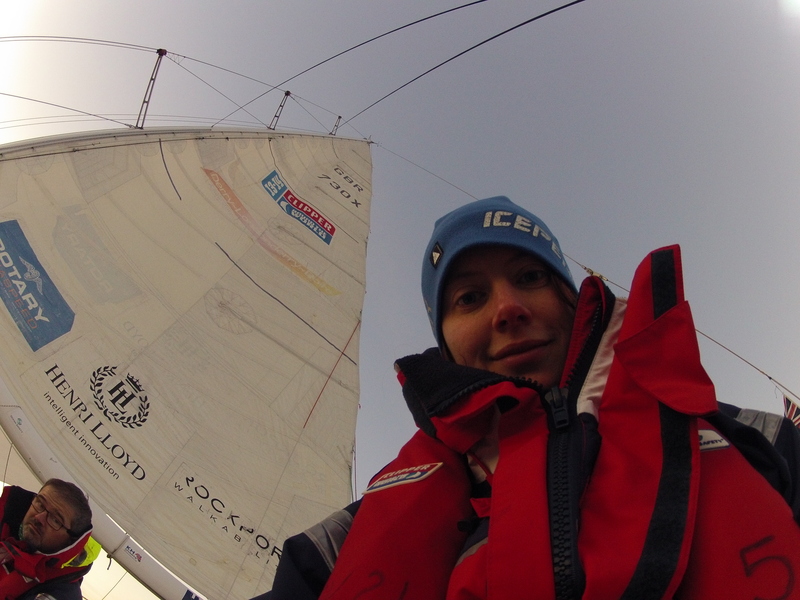 Basically very long training days with the focus being on flying the spinnaker and also improving on the basics. Gareth, the skipper, was a good source of information having skippered on both 11/12 and 13/14 races. The mate, Paul, was also very supportive especially when I was getting pissed off at myself for struggling with the basic concept of sailing with the wind behind you. Hopefully the dinghy sailing I am doing in May will help with this particular point of idiocy on my part. Again the seasickness monster crept upon me whilst I was preparing lunch in the galley one day. I find cooking on board a stressful experience. I hope it will be better when you are just focused on mother watch so you don’t have to keep getting dressed and undressed again. Kwells seemed effective – took about ½ hour to kick in and I was back to myself and happy to go downstairs and finish the washing up. I also decided to take my Sturgeon the next few days and felt fine. Although didn’t really do any more cooking under sail so hasn’t had the full test. That will have to wait until Level 4. Like when people kept asking me when I was scared to go to the rig and I laughed and genuinely said no without thinking about why they were asking, so was the case with difficulty of life aboard the Clipper 70s when they heel over. OMFG they heel over and yes, life really is more difficult at a funny angle! You are basically almost stood up on surfaces that are usually vertical. Up on deck is interesting. Sitting on the rail clinging on by the back of your arms on a wire is uncomfortable. Below deck is slippery slidey monkey frame fun. Getting to the heads or to the galley tap should really culminate in being awarded a crystal and 5 extra seconds in the crystal dome. One poor lady on Unicef fell and broke some ribs during the training week. Hope she recovers soon. I threw up several times but seemed to be back to normal within a day. The bulk of the days on Level 4 are spent on 2 practice races. On the first we went to Cussey near France, then to the Eddystone Lighthouse before heading back along the south coast. Was so happy to get to see Eddystone, I had hoped one day to reach it by sea kayak, maybe one day I still will. On the first race we came 2nd. I think our key to doing well in both races was not giving up and pushing on especially when the wind dropped. In the second race we started right at the back (the race started without us – I think they feared our Le Mans start! ), then we wrapped the kite. By the time the race was called we had climbed up to 5th with the other boats (bar Team Olivier) within reach. Daniel is good skipper – knows his stuff, is very patient with us and a nice bloke overall. Once again the crew were lovely – all very hardworking, tough and motivated. Also very competent and eager to learn. In some ways it is a bit intimidating because I am coming in with so little sailing experience but in other ways good because I will have to keep pushing myself to keep up. Inspecting bruises from the rail. I have some very impressive bruises on my inner thighs but I am not posting those on the internet!